If you are planning a trip to Rome then no visit can be complete with out a visit to the Fontana di Trevi or the Trevi Fountain as it is one of the most visually stunning fountains in the world. But there’s more to this beauty than meets the eye. The Fontana Di Trevi uses over 2 million cubic feet of water every day. The Trevi Fountain is a large structure – standing at 85 feet high by 65 feet wide. It has an intricate design, with water pumping out of many orifices. It also has a large pool at the front. So, as a result, it pumps 2, 824, 800 cubic feet of water through its system on a daily basis. This is one of the facts about the Trevi Fountain that earns the most surprise. However, the water is recycled and the same water is used over and over again so it doesn’t waste a drop. Italy’s fountains were originally built to show people where the fresh water was located. In the 4th Century there was around 1,352 fountains in Rome. Each one marked a fresh water supply for the citizens of Rome – usually from a natural underground spring. The Romans built aqueducts to bring the fresh spring water to the people of Rome who would collect it for drinking, bathing and cooking. 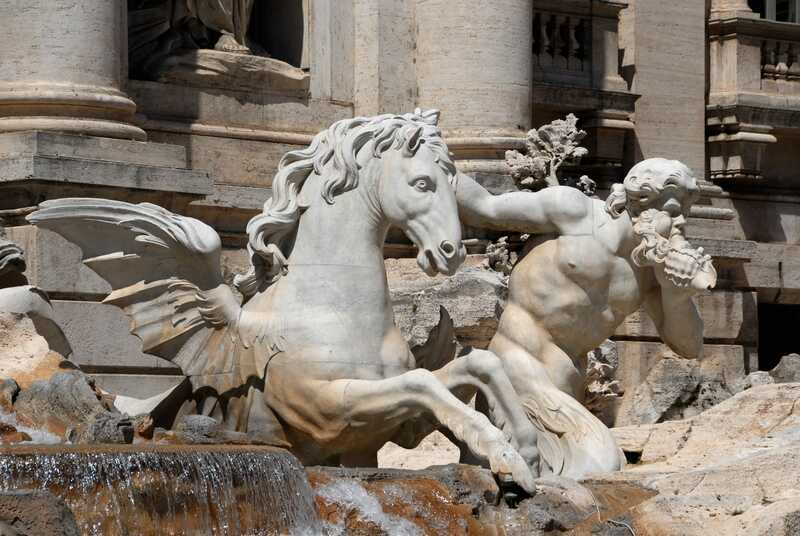 The original fountain on the current Trevi Fountain site was damaged during an invasion of Rome. The site later became home to the glorious Trevi Fountain. An average €3,000 is thrown into the Trevi Fountain on a daily basis. It is tradition to throw a coin over your shoulder into the fountain to ensure your return to Rome in the future. On an average day, around €3,000 can be thrown into the fountain by visitors. The money is cleared from the fountain each evening and put towards an incredibly good cause. Cash is loaded onto cards that can be used in supermarkets and they are given to the city’s most vulnerable residents to help them buy food. This is one of our favourite Trevi Fountain facts. Fontana Di Trevi means three street fountain. This is because the fountain sits where three streets meet. It also sits at the end of thee Aqua Virgo – an aqueduct that was constructed in 19BC and was one of Rome’s earliest. Fontana Di Trevi is Italy’s largest baroque fountain. It took 30 years to build and was completed in 1762. There had been a contest to design it. And a Florentine called Alessandro Galilei who had beaten Roman Nicola Salvi won the honour of designing the fountain. However, there was an outcry because a Roman had lost to a Florentine. So, Salvi did end up designing it. However, he passed away eleven years before it was completed and an architect and painter called Giuseppe Pannini completed the work. It is made from Travertine stone – the same as the Colosseum. The majority of the stone used in the Trevi Fountain is Travertine stone. The name Travertine means ‘From the Tiber’ – which is a river in this part of Italy. The statue at the centre of the fountain is often mistaken for Neptune. But it’s Oceanos. Oceanos was the god of fresh water. On the fountain, the Goddess of Abundance sits on his left and on his right is the Goddess of Health. On the one hand they are signifying that the people of Rome should always have an abundance of food and on the other hand, they should be free from sickness. If you are thinking about taking an Italian vacation, then please do visit our website at tours-italy.com to find out more about our tours of Italy’s capital city – Rome and our Italian vacation packages.